My blog posts and news updates are now automatically reposted to my Facebook page, so you can “follow” me there if you’d like to receive my latest updates via Facebook. I just recently enabled this, so presently there are just a handful of people following that page. I used to be super active on Facebook many years ago, maxed out at 5K friends (and with thousands more on a fan page). It was fun for a while, but I wanted to invest more energy in other pursuits, so I quit Facebook years ago (and Twitter as well). In late 2016 I created a fresh Facebook account to access some paid private groups that I belong to. I was reluctant to do so, but some entrepreneurial communities host their communities there, and it’s been worthwhile to have an account to access those groups. I am, however, happy to enable auto-posting of my blog and news posts to Facebook if it makes it more convenient for people who want to stay in tune with my latest work. That is scalable and easy to maintain. So… done! How are you doing at managing all of your online logins and passwords? Are you using strong passwords that are at least 12 characters long? Are you careful never to reuse the same passwords for different sites or apps? Is your system easy to manage? Are you easily able to login to sites on different devices? Bad password management puts you at serious risk of being hacked. In fact, there’s an easy website you can use to check if any of your passwords are already known by hackers. Just go to Pwnd Passwords and do a search. If you’re worried if one of your passwords has been compromised, you can find out in seconds. And if you find one of yours there, please change it immediately. My old system for password management was embarrassingly crude, relying on a combination of index cards, memory, and browser-saved passwords. I think partly this was because I started having online accounts as far back as the late 1980s, when most people used short, one-word passwords. So my system for managing passwords was in serious need of a redo. After some initial research on password managers, I learned that the top three are generally considered to be Dashlane, 1Password, and LastPass. I looked into LastPass first and rule it out. Then I tried 1Password (version 7) and found it lacking, especially in terms of its confusing interface design. Then I gave Dashlane a try, and I liked it right away. Apparently I’m not alone in this opinion. Based on my experience, I’d say these App Store ratings below paint an accurate picture. That one star difference (4.5 stars vs. 3.5 stars) equates to a significant difference in usability. I liked the setup process in 1Password, but actually using it to update my passwords was painfully slow; I felt like its interface was fighting me at each step. Dashlane was just so much faster and easier to use; it got the job done well. With Dashlane I was able to automatically import all of my browser-saved passwords from Chrome and Safari, which saved me a lot of time. You can also use it to store other data securely, such as frequent flyer numbers. Another nice feature is being able to grant some access to some or all of your passwords in case you become incapacitated or pass away. When I started I had around 300 online accounts, but many were obsolete. I simplified that down to about 120, which was a lot more manageable. Then I used Dashlane to change every password to a super strong one. Its built-in password generator really sped things along. I wanted to share this in case anyone else is in a similar situation, and you’d like to modernize your password management and make everything more secure. It’s estimated that by the year 2020, most people online will have about 200 accounts to manage. Maybe you’re there already. A good password manager can help you keep those logins and passwords organized, and it can even log you into sites automatically. You don’t even need to remember your passwords. I wanted something easy to learn that I could use on a daily basis, something that worked across multiple devices, and something that would simplify my life. Dashlane does all of that very well. Dashlane has robust free version, so you can try it out and see if you like it. And then it’s just a $40 per year ($3.33 per month) if you want to get their premium version. They also give you 30 days of the premium version free up front. I’m not an affiliate, so there’s no commission for me if you buy. I’m sharing this mainly because I figure that if this solved a problem for me, it might be useful for you as well. Since I’m a user of Dashlane though, you’re free to use my referral link if you want – it will give you 6 months of their premium version for free ($20 worth). And I’ll get the same bonus in return. So that’s a nice win-win arrangement. Today Ryan Eliason is giving away another freebie – a one-page Mind Map that summarizes his best ideas on how to build and grow a profitable, heart-centered business. This is especially relevant for life coaches, business coaches, consultants, counselors, therapists, healers, seminar leaders, online marketers, authors, speakers, activists, artists, musicians, yoga teachers, and anyone who works with clients. Ryan’s coaching specialty is helping people create and build successful businesses that strongly align with their values. If you provide your email address when you download Ryan’s mind map, you’ll receive an invite to attend his upcoming webinar series for free. If you’re interested in building and growing your own business, feel free take advantage of his training. Thousands of StevePavlina.com readers have done Ryan’s training, which covers key principles and real world case studies. This is the only time Ryan will be offering this free training in 2018. After the free webinar series, Ryan will be offering a deal for his paid coaching program. The benefit for you is that you can absorb a great deal of his wisdom and experience for free before you even decide to do the paid program. A high percentage of the students that completed Ryan’s paid coaching program were StevePavlina.com readers, so one reason I’m helping Ryan promote the series is that I know from experience that many readers will be interested in both his free and paid training. Please note that this PDF will only be available for free for about a week, so be sure to download it now and save a copy. Note that it does require an email opt-in to download it, which will also give you access to a free webinar series on entrepreneurial success. If you’d like to make faster progress on your journey towards abundance while following your path with a heart, here’s a free resource to help you. My friend Ryan Eliason is about to do his big once-a-year launch of Visionary Business School later this month, and in the days leading up to it, he always gives away many freebies to help people get started on this path. 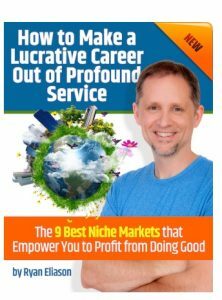 Today Ryan is sharing his 92-page ebook called How to Make a Lucrative Career out of Profound Service. It’s about creating abundance (for yourself and others) through contribution. You can download it now for free. The book is only available this month (June 2018), so even if you don’t have time to read it right away, download it and then read it when you have time. Just be aware that you’ll need to opt-in to Ryan’s launch list to get it. My friend Ryan Eliason will be releasing several freebies this month only (June 2018) to help people who are interested in creating a successful business that creates positive ripples in the world. Today he’s giving away a free PDF called The Revolutionary Entrepreneur Manifesto. I’ve been enjoying such a business for many years, and I have to say that it’s wonderful. Every day I get delightful feedback from people I’ve helped over the years. Hundreds of my readers run such businesses as well. If you feel like this is your path too, I encourage you to read this PDF to help get you started. It’s an easy read, and it will help you gain the right mindset for success. I think you’ll find Ryan’s story inspiring. He spent the last 25 years coaching and training thousands of socially conscious entrepreneurs from 85 countries. When you download the manifesto you’ll also get instant access to Ryan’s new video training. Since this is a skill I very much need to work on, I’m planning to kick off another 30-day challenge next month, most likely starting on Monday, May 14. For 30 days in a row, I’ll work on delegating and outsourcing tasks (both personal and work-related) in some fashion, so I can lean further into team building. This will be a social challenge with other groups involved, including members of Conscious Growth Club. So far about a dozen CGC members have expressed a desire to join the challenge, and at least two dozen non-CGC members said they want to join in as well. The plan is for us to share ideas, actions, and results along the way; hold each other accountable; and basically encourage the heck out of each other. Delegation and outsourcing are skill sets that many people struggle with, whether they’re entrepreneurs or not. Many of us, myself included, have some limiting beliefs and inner game shifts to work through in order to access the full benefits of delegation and do a better job of leveraging our core strengths. So the goal of this challenge is for us to make a big push forward by facing our various delegation blocks through direct action. This will create further positive ripples by up-leveling the impact we can have. Most likely I’ll commit to a specific minimum standard for this challenge, such as assigning at least one task per day to someone else or working on delegation and outsourcing for at least an hour per day. I think it makes sense for each participant to define their own minimum standard based on their situation. I’ll probably go with the one-hour approach since it gives me more flexibility. Some days I may invest more than an hour. In CGC we’ll be using the member forums to coordinate the daily sharing with members who are participating. I also intend to publicly blog about this challenge as we go along, sharing my own experiences and any interesting lessons we learn along the way. For 2018 we’ve changed the time of our Conscious Growth Club group video coaching calls from 10am to 7am Pacific time on Thursdays. We’ll be testing this new call time for a month or two, and if it works well, we’ll lock it in for the rest of the year. I’m pretty sure we’ll stick with 7am for the rest of the year though. We have some pretty active members in Asia, so this makes the coaching call times more accessible to those members, basically putting the middle of the night over the Pacific Ocean. It’s also reasonable for most of our members in the Americas and Europe. We did our first call at this time today, and it went very well. I’m definitely a morning person and love getting up at 5am and going for a morning run, so 7am is a great peak time for me to be doing these calls. CGC currently has 97 members in the Early Access group (99 if you count Rachelle and me). I still expect to do the full launch in March of this year, and I’m currently aiming for March 9 to 23 for our launch window. That’s still tentative for now, but I’m looking to lock in the launch dates soon. In the second half of January, I’ll also record and publish our first full video course to the CGC member portal, which will be on setting and prioritizing goals. We’ve built some terrific momentum in CGC during the past 8+ months, and there’s a lot of growth-oriented activity in the forums now with members doing physical fitness challenges, exploring cryptocurrency investment, building passive income streams, making lifestyle improvements, and more. Some members even kicked off a 365-day exercise challenge, starting on January 1st. I’m especially glad that we opened it for Early Access in April of last year and attracted dozens of members right away. This gave me the opportunity to work with the most motivated people to explore what we could co-create together. I had a reasonably clear idea of it from the get-go, and that vision has continued to evolve based on feedback and experimentation along the way. I think this evolutionary development aspect will always be a part of CGC, which must continue to adapt to the needs and desires of our members in order to keep pace with them and to remain a powerful, growth-accelerating resource. For our next wild experiment, we opened a 24/7 always-on video chat room in Conscious Growth Club yesterday morning. I’ve been wanting to try something like this for a long time, so our members could pop in, connect, and talk to each other live whenever they want – and without my having to host any calls. I’m calling it the CGC Watercooler just as a placeholder name, but we’re discussing other names like the CGC Lounge, CGC Campfire, or for Harry Potter fans… the Room of Requirement. I love that whenever I want now, I can pop in and chat live with any members that are hanging around our virtual watercooler. Maybe sometimes it will be empty, and sometimes there will be 5-10 people in there having an interesting conversation. I let everyone know this is experimental for now, and it seems to be going well so far. I hung out with a few of our members when we first opened it and chatted with them for more than an hour. This is a nice bridge between our regular video coaching calls and our discussion forums. It makes it easier for our members to connect socially and get to know each other. And it’s great for people who want more of that human connection – more energy flow and less friction for people who’d rather chat live than type messages to each other. It’s going to be fun to explore what we can do with this in the weeks ahead. I can see some of our digital nomad members live-sharing parts of their travel adventures, for instance. This might sound like a stretch, but down the road I expect we’ll be able to have an always-on 3D virtual meeting space that members can hang out in whenever they want, like with 3D headsets. It’s just a matter of time before the technology matures. Tech-wise it’s probably possible to have this today, but the adoption isn’t there yet. It’s really cool to consider all the tech we’ll be able to leverage in the years ahead to make CGC even better and to empower our members to connect in interesting ways. This new video chat lounge also nails a real need that some of our members have, which is feeling like they’re the only people they know who are into personal growth. And many don’t like Facebook much… especially its many distractions. So I love that we’re able to provide an independent, ad-free space that’s all about the connection and conversation. If anyone feels lonely or down, they’ll always have a place to go that’s filled with encouraging people to bring them back up again. Another thing we’re doing is putting together a map of where our members are located around the world (optional participation for those who want to do so). This way when people travel, they can see if there are other members in the vicinity and arrange meetups if they want. People have already been doing this even before we had the map, so this should make it easier. Visually it looks like a big map with lots of pins in it. I have to say it’s really inspiring to look at that map and see all these pins wrapping around the planet. In case you’re wondering, we’re aiming to do the full launch of CGC in March 2018, so that’s when the first official year will begin. This means that there are still about 3 months of Early Access time left, which is free bonus time for anyone who joins now. The Early Access period started in late April 2017, so anyone who was smart enough to join back then is getting a great deal. Some members have made huge strides forwards in their lives already, mostly just by leveraging the forums, so it’s exciting to think about the gains people will be able to make as we keep improving CGC month after month. In January I’ll record and publish a video course on Goal Setting and Achieving in CGC, and in February I’ll create one on Taking Action. I especially love that our members are taking the initiative and leading their own experiments and accountability challenges. There’s a passive income group doing weekly calls to build their own passive income streams and support each other as they go. And this month there’s a group doing a 30-day exercise challenge. It’s really fun seeing so much growth-oriented activity… almost like a Disneyland of its own for people who love to immerse themselves in personal growth. I’m not an affiliate. I’m just a fan of brain.fm. I first tried this service in early October after a fellow CGC member recommended it, and I’ve been using it nearly every day since then. I was able to upgrade my previous subscription to this lifetime offer this morning, so I took advantage of this deal myself. Brain.fm is an online service that streams algorithmically generated music or ambient sounds to help you focus, relax, or sleep. Brain.fm appears to be the next level beyond binaural beats in terms of how effective it is at synchronizing my brain to a highly focused and alert state. It’s great for productivity, especially if you like being in a contented yet stimulated mood while you work. My favorite brain.fm sessions for focusing are the electronic music, thunder, rain, and beach tracks. I usually feel very focused about 10-20 minutes after starting. Although there are a bunch of different tracks to choose from, I favor the electronic music track about 60% of the time, mainly because I find that it works the best for me. For relaxation and sleep, I think brain.fm is just okay is terms of effectiveness, although I haven’t used those aspects as much. I don’t have sleep issues, so maybe you’d find it more helpful if you have insomnia. There are iOS and Android app versions, but I normally play this through my laptop browser. This is a great deal that doesn’t come around often, so if you’re looking to treat yourself to a nice service that could boost your productivity, I think you’ll like it. There’s a free trial too, so you can test it for several sessions to see if it works for you, and then grab the lifetime access if you want. This deal also comes with a 60-day money-back guarantee.